The proper use of switching power supplies improves the reliability of your electronic equipment. Incorrectly connected sense terminals will cause internally generated overvoltage. Higher sense compensation than the maximum allowed voltage of the power supply may damage the overvoltage protection of the output or create malfunction. The use of multi-output / single-stage power supplies, outside the parameters defined in their datasheet, is not recommended because, in that case, overheating on internal components and/or output over-voltages may be generated. The application of an input voltage different from the power supply‘s ratings may damage the unit ! The PSU require a DC or AC supply voltage within a well specific range. Even an input voltage with a correct amplitude but with a distorted wave could prevent the PSU from proper operation. Therefore read carefully the datasheet, the workbook and the product label. If your supply system doesn’t match the requested characteristics please contact the PSU manufacturer or distributor. The amplitude and the waveform of the input current depend on the unit configuration and the characteristics of the supply system. In a DC system, for a given output power, the current amplitude depends on the input voltage amplitude and the unit’s efficiency. For AC systems most power supply units behave like a capacitive load, having an input stage with a bridge rectifier and smoothing capacitors. Therefore they draw from the mains a reactive current, increasing the current needed for the same output power. We take into account for this surplus introducing the power factor. As stated above the input impedance of a PSU is mainly capacitive. Even DC input units need bulk capacitors for proper operation and to fulfil hold up time requirements. Therefore when the unit is switched on, there is a high current peak drawn from the supply due to the capacitors charge. This initial current is called the 'in-rush current'. The worst-case occurs when the input voltage is at its maximum. With an AC supply this takes place at the peak of the input voltage sinusoid. The in-rush current is several times larger than the steady state peak current. A protection circuit attenuates this effect allowing a more suitable choice of fuses, main switches and other parts added to the input line. If the switching power supply's built-in fuses are blown, something may be damaged in the internal circuits. In this case, the switching power supply will not recover even if the fuses are replaced. Please contact the manufacturer or distributor. Even the most efficient switching power supply will not operate properly if installation, wiring and connection are incorrect. Follow the instructions specified by the manufacturer before using switching power supplies. Make sure the unit will be properly ventilated. Forced air improves heat dissipation much more. Output power depends on operating temperature. Derate the power of the unit according to the derating coefficient indicated on catalogue. Connect the ground/earth terminal of the PSU to the frame of the equipment with short, thick wire to ensure safety and prevent noise. Output Voltage adjustment and O.V.P. Power supplies must be integrated in the final equipment or placed in the operating location before power up. All units provided with a protective earth (P.E.) terminal must be connected to the earth system, directly or through the equipment ground. Hazards may arise from the inobservance of this rule. The connection must be fixed so that vibrations or ageing can’t compromise its integrity. The internal RFI filter introduces a leakage current in the earth path. It must be kept within the limits specified by the relevant safety standards. A reliable connection to the protective earth (P.E.) must be guaranteed in order to avoid electrical shocks. For a safe wiring of hazardous voltage lines, use only wires with a suitable insulation grade. To prevent wiring materials from heating or ignition, use wires which can handle the rated current plus an additional margin to withstand particular conditions as overloads and short circuits. When the current is shared by multiple loads, each branch has to be dimensioned for the total current. Each load connected with a thinner wire, must be protect separately with a fuse, otherwise its short circuit may not be able to operate effectively the main overcurrent protection. Input and output lines connections must be kept as far as possible from each other, as well from internal source of noise like digital processors and pulse transformers. Picked up noise can spread around in the form of conducted or radiated emissions interfering with equipments placed in the neighbourhood. For the opposite reason avoid loops with the connection cables, as they could effectively pick up noise from the external environment and interfere with the equipment’s functions, even if the PSU has a good immunity. A good practise is to twist every line with its return and the adoption of shielded cables. A main item is the grounding technique. A perfect solution doesn’t exist, especially for stand alone units which haven’t the protecting enclosure of a complete equipment. Short, thick and wide ground connections are effective at low frequencies, but at higher frequencies particular care must be taken, above all to fix and to terminate shields. 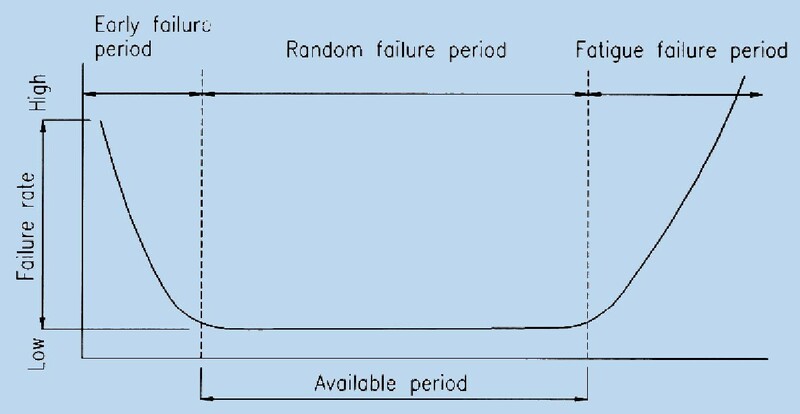 The following figure shows the failure rate curve (bathtub curve) during a typical product life cycle. To prevent early failure, each manufacturer screens all parts or performs ageing tests on the finished product. Therefore, when switching power supplies are delivered to users, the power supplies have already entered the random failure period. At some time, the switching power supply will enter the fatigue failure period. - Each part of a switching power supply distinctly differs in its service life depen¬ding on the ambient temperature. An electrolytic capacitor used as a smoothing filter is sensitive to variations in the ambient temperature because of the chemical reactions which occur inside it. Typically, the service file of electrolytic capacitors decrease by half if the ambient temperature increases by 10°C. This characteristic determines the service life of the switching power supply. - if the switching power supply is used at high temp., the electrolytic capacitor may enter the fatigue failure period while the other parts are still in the random failure period. To increase the service life of the switching power supply, it may be necessary to replace and overhaul the electrolytic capacitor. The above temperature value differs according to each switching power supply. A cheaper, reliable and simpler solution is a passive corrector. It is a series inductive element placed between the bridge and the smoothing capacitors. It gives just an harmonic attenuation, therefore there’s a limit to the filtered power. Sensing inputs S+ and S- are provided in order to compensate for the voltage drop in output cables connected to high power loads. Sensing wires should be shielded or twisted to reduce the noise that could be picked up along the path. Note: sensing wires must be connected before power up and after load connection. The sense circuit can’t absolutely carry the load current even for few seconds. This input causes the converter shutdown. The output voltage follows the curve shown in the figure. It operates differently according to the PSU model. For further details, see the relevant data sheet. This signal gives the output voltage monitoring and is performed by the circuit shown in the figure. This signal is available with the PF option, together with the RESET signal. 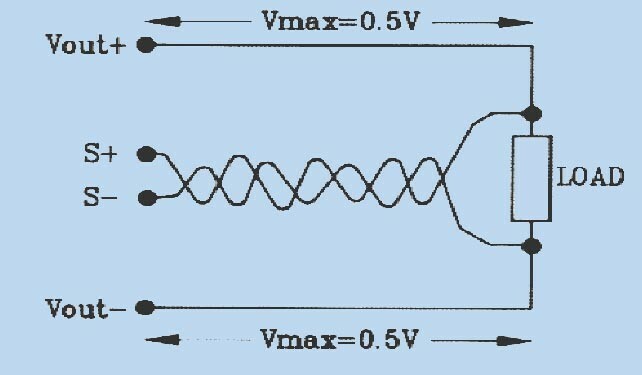 This signal indicates the condition of Vout and is obtained with the circuit shown in the figure. 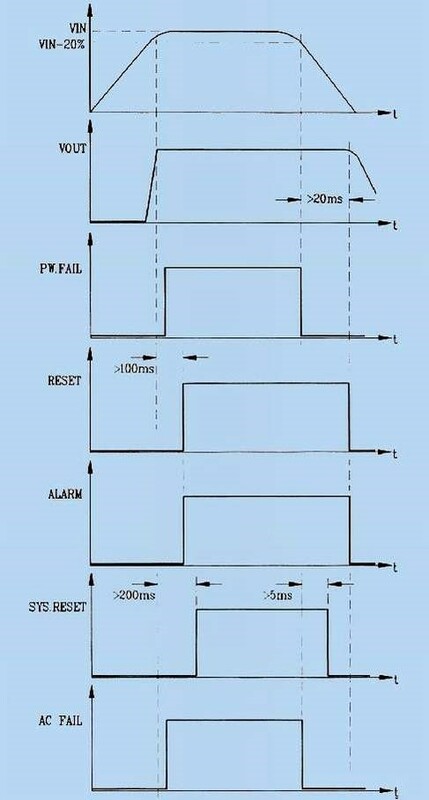 This signal is obtained with a relay as shown in the figure. Are optional provided on power supplies for VME-BUS applications. This option (ref. PROG) is available for single output units where is required the adjustment of the output voltage within a given range. The programming input voltage range is usually between 0 and 10 V.
Besides Vmin and Vmax, the Vout values with Vprog not connected must be specified. Maximum ratio Vmax/Vmin is 10. It’s not available on multiple outputs power supplies.